Hi Martha! Thank you for inviting me into your studio, can you introduce yourself and your practice? I’m a London-based Artist mainly working in cloth and 35mm film. 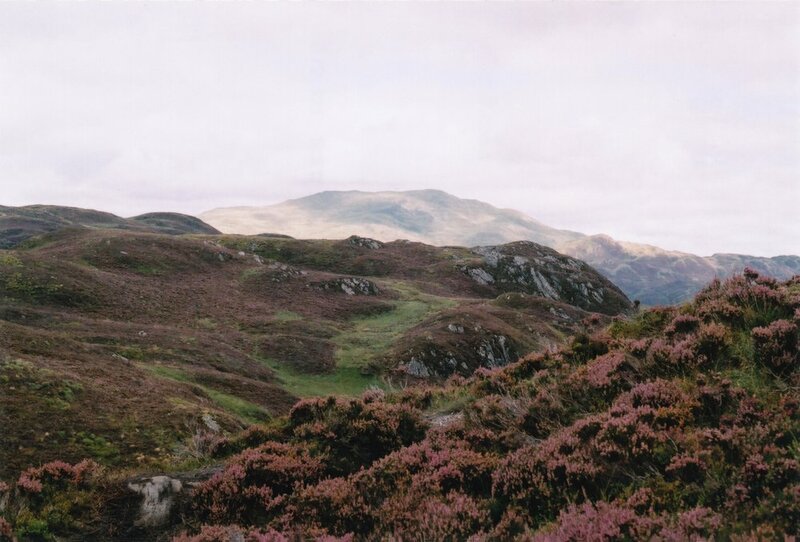 My interests lie primarily in colour, nostalgia and the form of landscape. A past project I worked on was based on the first half of the novel 'Swamplandia!' by Karen Russell. This concept performance piece transformed Karen Russell's novel into an immersive piece of theatre that takes you from, the normality of a girl scout camp to a midnight spectral stomp. The piece was set in Manchester Baths, an abandoned swimming pool disguised as a disused alligator theme park. This is where the scouts have set up camp. The scout characters earn badges by conducting occultist activities like séances, clairvoyance or conjuration etc. Creating a dream like experience beautiful and spooky, with the glow of green colours, a watery haze. I ended up creating two of the scout costumes which are hanging up in the studio. What projects are you working on at the moment? These costumes are fantastic! I’m currently working on two projects. The first is with an illustrator called Ella Webb (who is my sister). We are working on designing and making a three-piece clothing collection. The collection is built on characters that’ll go alongside her illustrative work, looking at pattern and colour. (Her works examine landscapes and the natural world; reminiscent of geographical textbooks.) We plan to travel to the locations that the clothing’s narrative is based upon to photograph them. Hopefully working with local photographers along the way. The first of these outfits we want to set within America’s pastures or deserts. The second project is a clothing collection called ‘every time I go to look the sun gets in my eyes’ where I’m working in, potentially, Japanese Denim. The collection is designed with features of practical and protective clothing. I also wanted to incorporate elaborate highly reflective blue beading into the designs. I'm extremely interested in the idea that within the natural world blue is scientifically an extremely uncommon colour and by creating clothing in a highly intensive blue, how that might look within an expansive landscape. I’m really interested in how you capture images from your travels and create your own linen postcards. Can you tell us about the inspiration behind this body of work? In my freetime I take photographs on 35mm film. I turn these photographs of my travels into linen postcards using the texture of linen paper to create a soft painterly effect. I try to recreate nostalgia through colour, a hazy souvenir greeting or a small 90mm x 140mm window of ‘wish you were here’s’. I take inspiration from my vast collection of postcards featuring volcanic scenes, swamplands, California wildflowers, deserts, mountainous views or Japanese temples. I have sentimentality towards old linen postcards. I’ve been listening to a podcast about this subject called ‘podcast from the past’. I like the process of taking a piece of card with an image, a small space to write not much at all, that can hold so much memory for someone. Whether it be the person sending it or receiving it. I also find beauty from the mundanity of it, like someone's written description of the weather or how nice the house that they’re staying in is. It sounds like you are working on quite a few interesting projects! 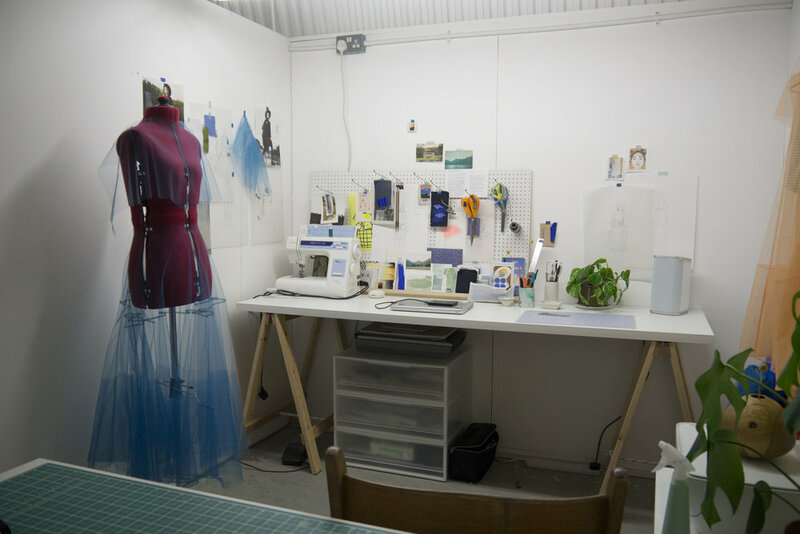 How Do you think having a studio space at Spare Street has helped you develop your work? It’s been amazing to have the floor space while living in London, being able to have a studio to focus and experiment on current projects, away from the home, has given me a focus that I struggle to find otherwise. I’ve enjoy having a white space that is completely my own, I can fill it up with work and immerse myself in my thoughts and ideas. The studio space is such a necessity when it comes to focus and experimentation plus It’s always interesting to see other artists work in the spaces within the building. I would like to research further into current environmental issues around clothing. I recently listened to a BBC Radio 4 program about waste and environmental issues when it comes to the fashion industry. I’m using a lot of denim for my current project and ideas such as freezing the fabric as a cleaning process appeals to me. I’d like to create a project that approaches the fashion industry in as broader sense as possible particularly with regards to sustainability. A book I recently read called The Wild Dyer, A guide to natural dyes by Abigail Booth has some ideas I’d like to pursue, particularly on how plants and seeds can be used to create colour. © Martha Webb and Hotel Elephant, not to be reproduced without prior written consent.